Hi! 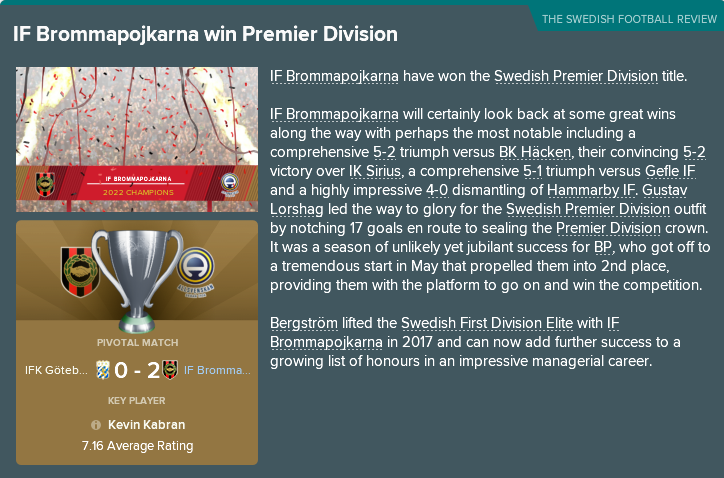 MikaelinhoFM here with the fourteenth episode of my first ever FM18 blog “The Bromma Boys” about Swedish talent factory Brommapojkarna, and I must say that I’m really loving both the save and this blog series. If you missed last seasons’ updates, do go back and read them through the links below. I’m absolutely fuming! The board went and did it again! Accepted a bid for my star player and then turned a deaf ear to all my protests. 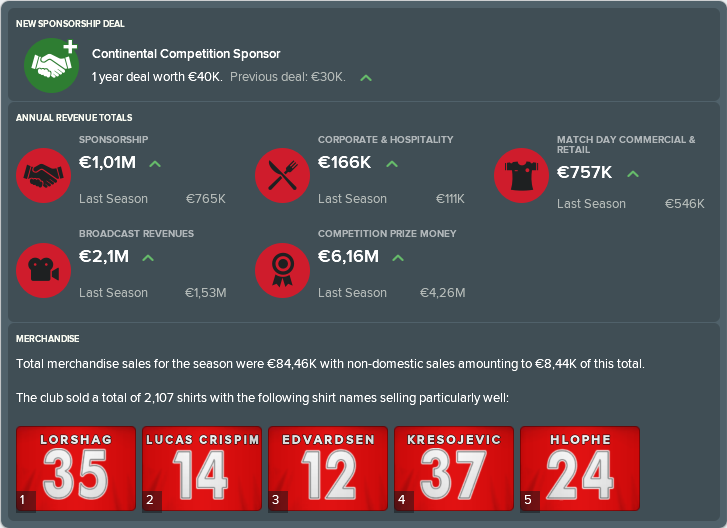 I spent most of the pre-season fending off bids for Australian wonderkid Lewis Park, telling the interested clubs that I wanted €10M up-front and 50% of the next transfer fee in order for him to go. Out of the blue the board accepts a bid from Belgian side Genk for €5.75M. I try to protest, but with no success. Right before the first knock-out round of the Europa League our star player leaves for our opposition. I’m absolutely furious and have a hard time understanding the thinking of the board. Ok, €5M is decent money, but we already had around €2M in the bank, so we were in no financial crisis. Awful, just awful. In addition to Park leaving we also got rid of recent signing Adjeh Sowah. Long story short: he got a straight-up red card, I fined him, he became angry, I told him to go to hell. Ivorians Karamoko and Coulibaly came in as Academy prospects along with Mårtensson, so we’ll cover these players in detail in the coming Academy episode. The other three signings were all aged 21 or younger along the lines of our new transfer policy covered in Bonus Episode “A five-year plan”. Shell-shocked, we still tried to do our best against Genk. We lost quite undeservingly with 0-2 at home, making the progression to the next round real hard. We took the lead away in the fourth minute and kept pressing on for another goal. Instead Genk equalised, making it 1-1 in the game and 1-3 in total. We were out of the Europa League, despite being the better team over the two games. Well, no time to sulk with the Swedish Cup right around the corner. We cruised through the group stage with three straight wins, the most impressive win being our 6-0 thrashing away to fellow Allsvenskan team Gefle. Of course our three wins meant that we won our group and advanced to the knockout stage. We got drawn against antagonists Hammarby, but the feeling was that we were pretty much unbeatable. We were abruptly shown that this wasn’t the fact as Hammarby came out the better team from the start in front of 31200 fans. We managed to take the lead undeservingly, but Hammarby quickly equalised and then took the lead a few minutes later. We really looked pale, to say the least. The rest of the game was like taken from a Hollywood film. Hammarby midfielder Bonke Innocent got a red card in the 42nd minute and the match started swaying over in ourfavourr. We were awarded a penalty! And hit the post. We were given a free-kick near the penalty box! And hit the cross-bar. In the middle of our furious hunt for a goal Hammarby countered on us, making the score 1-3. Amazingly, we got back in the 85th and 87th minute, forcing extra time. We continued to be the stronger side in the extra time and won through a goal by Sigurðsson in the 96th minute. What. A. Game. Strengthened by the win we went on to crush IFK Göteborg in the semi-final with 3-0 after a Lorshag hat-trick! We faced IFK Norrköping in the final and started off pretty much like in the quarter-final against Hammarby. Norrköping got an early two-goal lead and we looked like we didn’t want to be there. After a few changes to our midfield we took over possession and scored a 1-2 goal. We kept pushing for an equaliser, but Norrköping countered on us, were awarded a penalty and killed the game with a 1-3 goal. We finish 2nd in the Cup, which is something of a disappointment considering we were reigning champions. We’ve been solid so far as you can see, standing unbeaten after the first 14 games. After a few tactical tweaks following our three straight draws we’ve been fantastic defensively with 5 straight clean sheets! We have been dominant and won possession in every game, but we’ve struggled a bit when it comes to efficiency in the opposing penalty box, creating a lot of chances, but not converting them into goals. 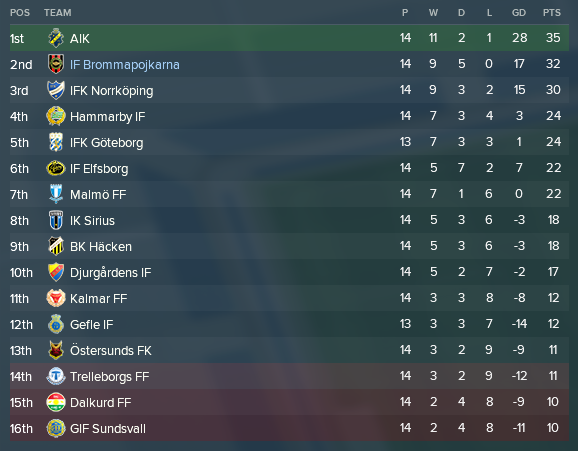 All in all a great first half of the season, but unfortunately local rivals AIK have been absolutely amazing so far, winning 11 out of 14 games with a fantastic goal difference of 28 goals. In order for us to win the title we will need to keep our stability and hope for a slip-up or two from AIK. In the end of July we’ll play an absolutely crucial away derby! We go into the summer break brimming with confidence, and for the first time in BP history we have players participating in the World Cup! Stephen Sama has been called up for Cameroon and Gustaf Lorshag and Niclas Berglund for Sweden. We have also re-invested the Lewis Park money, making four absolutely top signings joining us when the transfer window opens in the middle of July, very exciting indeed! Comment: A central midfielder with his strengths in the technical game. Lacks a bit of defensive skill to handle the defensive midfielder position, but might do the job for us a bit higher up the pitch. Comment: A package deal along with Awuah from München Lions. Looks like a solid attacking player with nice Skill and Movement. Lacking a bit in Perception, but hopefully that’ll rise as he gets some top-flight football. Comment: “Lisa Lopez with a lisp” looks like a real bargain! Well-rounded as they come with a nice looking set of physical attributes makes him well suited for a role on central midfield. The only downside is the €1.9M minimum fee release clause, which I’ll try to negotiate away later. Comment: A player we’ve been keeping an eye on for over a year. He had a release clause of €6.5M and his Brazilian club São Paulo wouldn’t let him go for less, which made a deal absolutely impossible considering our financial situation. However, after a falling out with his club he demanded a transfer. We saw our chance and offered a cheeky €1.5M bid which São Paulo obviously rejected. This made Magrão furious, he went to the newspapers, the other players started revolting etc, so when we came in with a slightly improved bid they were more than willing to accept it to get rid of him! Technically gifted with some great Flair he’ll be able to step right into our AMC role. Lacks a bit of character which worries me a bit, but hopefully he’ll improve in coming years. A potential star! 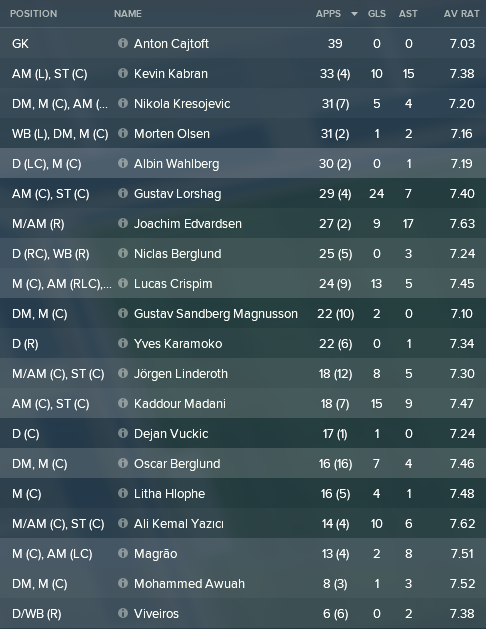 We managed to keep our good form in the second half of the season, with a single loss to AIK. After that game we won 10 out of our 12 final games, passing AIK and eventually winning the title quite comfortably with a seven-point margin! Finally, our first league title! It feels amazing to be able to call ourselves Champions, but it feels even better to get the chance to qualify for the Champions League next season. If we manage to reach the group stage our financial situation would improve by a mile! I also hope that we’ll be able to attract even better prospects as a potential Champions League club! We finally win the Premier Division! For the first time ever we were seeded going into the qualification rounds, which gave us our easiest way into the group stage yet by far, as you can see above! No disrespect to the teams above, but no real household names or European sleeping giants there, right!? We smashed all of them, which gave us a comfortable route into the group stage. I felt that the draw was pretty tough, but without any impossible opponents. Obviously Marseille were favourites with Hoffenheim slightly behind, but I felt that we couldn’t be completely ruled out beforehand. We started off shaky with a disappointing draw against weakest side Danish Sönderjyske and a loss away to Marseille. Then, pretty much out of the blue, we smashed Hoffenheim 6-1 away! We ended the group stage with three draws, landing on 7 points in total. Surprisingly and luckily, this was just enough to secure us a spot in the knock-out stage ahead of Hoffenheim on the same points as us. As you can see above, we are slowly developing in every area, even though we still rely heavily on prize money and/our transfers out in order to balance our finances. However, if we keep improving and performing decently well on the European stage over the coming years, hopefully our sponsorship money will see a steady rise. Big contributors to our success this season were Gustav Lorshag with 24 goals, Kaddour Madani with 15 goals and nine assists in 18 starts and new signing Ali Kemal Yazici with 10 goals and 6 assists in 14 starts. Kevin Kabran also displayed another solid season with 10+15 in 33 games. Kevin Kabran won the Fans’ Player of the season award ahead of Lucas Crispim who won it back to back the last years. Lorshag was our top goalscorer yet again, but oddly enough didn’t make it into our team of the season where Madani was selected instead. Certainly my best season so far by quite the margin! So what that we lost the Cup final. 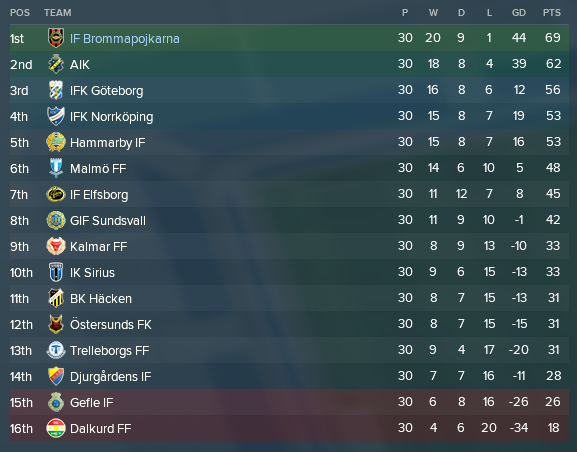 We finally managed to win Allsvenskan and we also made it into the Europa League knock-out stage for the second season in a row. Next season we will try to keep building on this success, perhaps laying the foundation to the dynasty in Sweden that we’ve been hoping for! Sweden is awarded another Champions League spot! Wow! These are some great news! 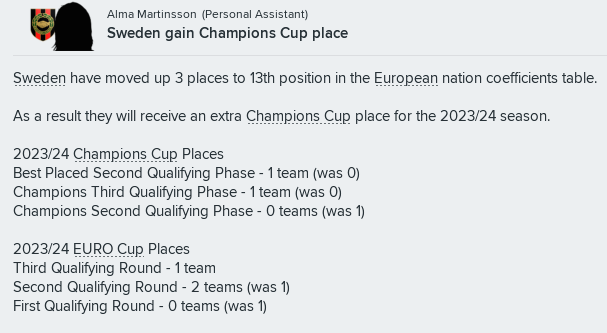 From the next season Sweden get two Champions League spots instead of one, which is something that has never happened in real life. This means that our goal set up in our five-year plan from the Bonus episode “A five-year plan”. of qualifying for the Champions League every season in the coming five a bit easier! In the next episode we will take an in-depth look at what’s been cooking in the Academy, aka the Talent Factory, during 2022. The talent pool is steadily growing, but are there any real superstars in the making? The only way to find out is by reading the next episode! 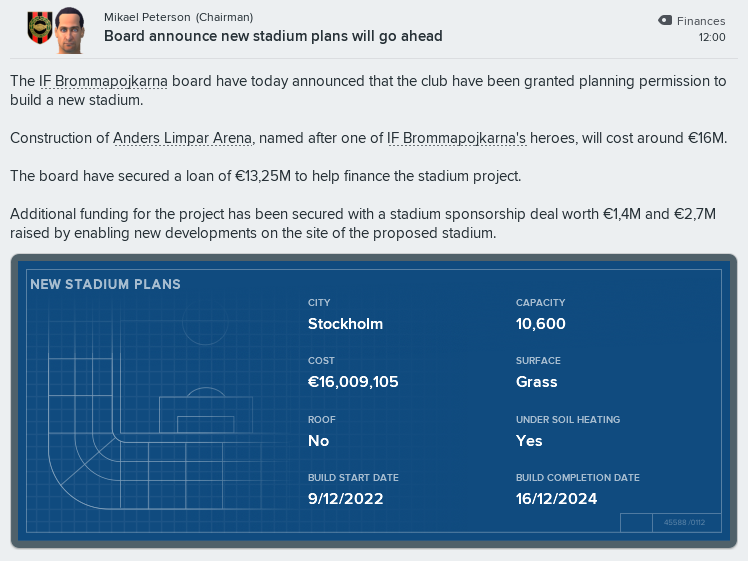 This entry was posted in FM18 Stories, Football Manager 2018, The Bromma Boys | @MikaelinhoFM and tagged brommapojkarna, europa league, fm stories, fm18, football manager, sweden, swedish allsvenskan. Bookmark the permalink.